CSM v3 sits in the system tray of any computer you would like to administer remotely, and allows you to communicate between PC's, send many different forms of messages to other users on your domain, either to a single person or as part of a more global notification to a larger number of users. This software allows you to obtain statistics of computers remotely, as well as control certain functions depending on the version of windows being used. 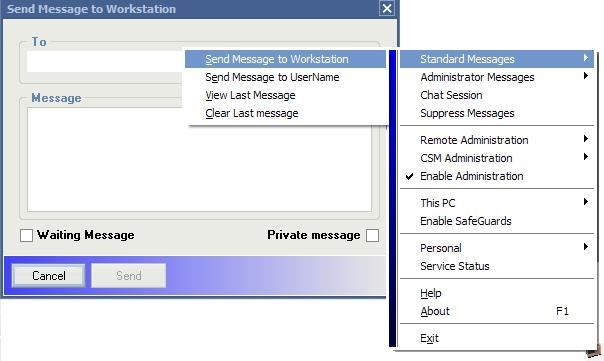 ٠​‌ Send text message via TCP/IP to any other client running CSM via their workstation name. ٠​‌ Send "waiting" messages (messages stored on a server until user logs onto their PC) via the workstation or username. ٠​‌ View your previously received message, and clear it for privacy. ٠​‌ Send a dialogue message (Error, Information, Warning or Confirmation box) to any username or workstation just like Standard messages. ٠​‌ Send global messages to all users running CSM. These messages appear as a thin banner across the bottom of the screen, just above the taskbar. ٠​‌ Send TAB messages (Fixed messages that stay on the screen until the administrator clears them). These can be used when advising users not to use their PC, as it is currently in use by the administrator. ٠​‌ Use customized startup scripts from CSM, that cannot be executed via a logon script, which more advanced and interactive, and you can still run any file from within it. ٠​‌ Remotely run startup scripts. ٠​‌ Remotely obtain status, start and stop Windows Services. ٠​‌ Remotely log off a PC (Windows 2000/XP only). ٠​‌ Remotely restart a PC. ٠​‌ Remotely shut down a PC. ٠​‌ Windows version of the classic "ping" command. ٠​‌ Use a ping search range. ٠​‌ Windows version of the classic "tracert" command. ٠​‌ Remotely retrieve stats and CSM logs from a client PC. ٠​‌ Personal Note (accessed from anywhere if CSM is launched on a server). ٠​‌ Personal To-do List (accessed from anywhere if CSM is launched on a server). ٠​‌ Personal Contacts (accessed from anywhere if CSM is launched on a server).